MyEtherWallet Review - Is this Web Wallet Secure Enough for Your Ether? You are at:Home»Reviews & Comparisons»Wallets»MyEtherWallet Review: Is This Web Wallet Secure Enough for Your Ether? MyEtherWallet Review: Is This Web Wallet Secure Enough for Your Ether? Update: Part of MyEtherWallet’s team will be moving to build a different Ethereum wallet called MyCrypto.com. The full story can be found here. MyEtherWallet (MEW) is a free and open-source client-side interface for Ethereum. This means you can use it to directly interact with the Ethereum blockchain via a web browser. Launched in 2015 by Taylor Monahan and Kosala Hemachandra, it allows the user to generate an Ethereum wallet in which he or she can store, send, and receive Ethereum, Ethereum Classic (ETC), and any ERC20 tokens. Although a wallet on MyEtherWallet is created online, it’s not an online wallet in the traditional sense. That’s because the wallet information (such as your private key) isn’t stored on MyEtherWallet servers. Instead, it’s stored locally on your computer or wherever you decide. Users are in full control of their private keys and therefore their funds, which is not always the case with web wallets. Creating a MyEtherWallet account generates a public key and a private key. MyEtherWallet does not store any user details. As such, a user is entirely responsible for his or her own private key and password. When a transaction is made, no fee is charged by MyEtherWallet—only the fee for the Ethereum miners (i.e., gas). The user interface of MyEtherWallet is fairly simple in design and is easy enough for beginners to get to the hang of. Creating an account is quick and easy, and the user is reminded to save his or her keystore file before opening the wallet. On the Send Ether & Tokens page, there are three boxes: the receiving address, the amount to be sent, and the gas limit. Again, it’s simple to follow, and most people shouldn’t have too many difficulties. If any issues do arise, there’s an extensive Knowledge Base with instructions on how to create a wallet and, most importantly, how to protect yourself and your funds. There’s a wealth of information there, and you’d be hard-pressed not to find an answer to a particular problem or question. You can also find video tutorials on some topics, which is a nice touch. One concern when it comes to web wallets is the lack of security on offer. But MyEtherWallet isn’t your typical online wallet. Indeed, one of the main advantages of MyEtherWallet is the wide range of security options it offers. Users have a great deal of flexibility when it comes to how they can access their wallets. A user’s account is secured with a password and a private key, which is generated upon opening an account. It’s highly recommended that you make a backup of your private key. Whatever you do, don’t store this sensitive information on your computer. Instead, consider paper or a secure external device. MyEtherWallet is compatible with the Ledger Nano S and Trezor hardware wallets. This is a big plus because these offline devices are free from malware, phishers, and keyloggers. However, you should still make a backup of the private key of the hardware wallet and store it in a second location. 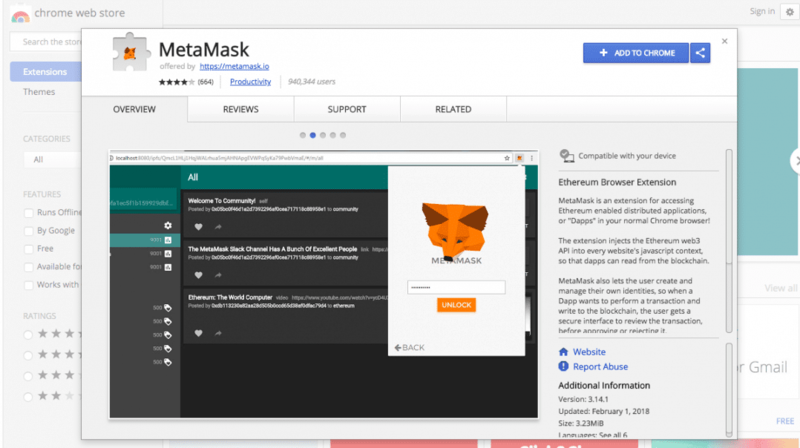 Another security option available to you with MyEtherWallet is MetaMask, which is an Ethereum browser extension. Downloadable via the Chrome store, it’s free to use and makes unlocking your MyEtherWallet quicker and easier. However, one of the main advantages is that the extension warns you when you visit a blacklisted phishing site (of which there are many!). Finally, users can also run MyEtherWallet offline and locally instead of on the GitHub servers. This is another great feature, especially when you consider that you can make offline transactions with it. Needless to say, there are plenty of security features—and that’s before we mention its compatibility with Mist, Geth, and Jaxx Wallet! MyEtherWallet has received mostly positive feedback from users. While some have complained about security issues and having their funds lost or stolen, many did not take the necessary precautions recommended by MyEtherWallet. Indeed, it seems that experiences regarding security really come down to the user and the amount of caution exercised. Generally, users are very positive about MyEtherWallet because it’s free and open source. That none of the information is stored by the website is a big plus in terms of security. Indeed, the flexibility offered by the various security options is one of the main advantages according to online users. Finally, MyEtherWallet has been praised for being user-friendly with a quick and easy process when it comes to creating a wallet and making transactions. In many ways, MyEtherWallet offers the convenience of online wallets without the many security vulnerabilities. A user’s experience depends on how he or she uses the options available. This is a user-friendly wallet that provides plenty of flexibility and security for peace of mind. Do you use MyEtherWallet? What do you think of it as a wallet for storing and making transactions with Ethereum? Let us know in the comments below! BTC.com Wallet Review – Is this HD Hybrid Wallet Safe to Use? I have a big issue with MyEtherWallet, with not being able to send or recieve tokens even though my token symbol appears in the token list. When I try to list my tokens is comes up zero. However, I can see on etherium.io my token balance and value (address and trx tran.